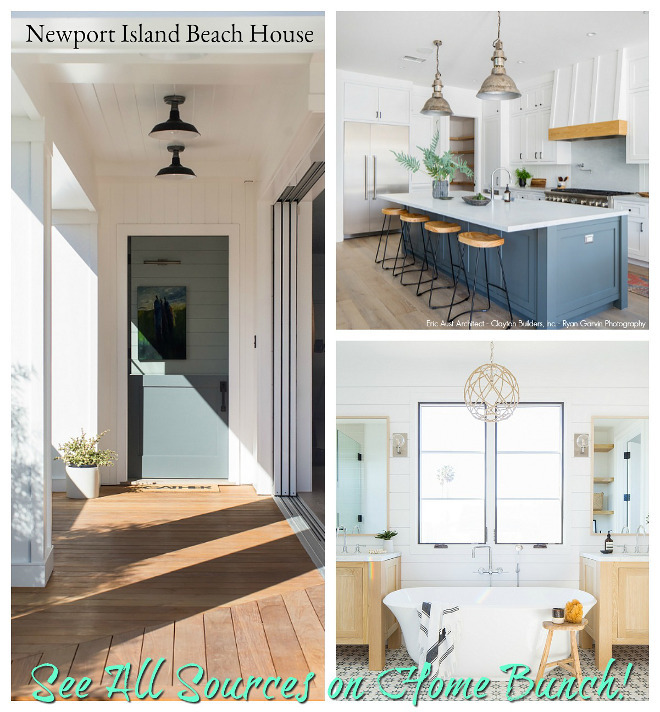 But before I take a few hours to read my book, I hope you enjoy this beautiful home renovation done by Molly Griggs Interiors and with photography by Marina Storm of Picture Perfect House (also featured here). This is a two-story colonial home that belongs to a young family of four. 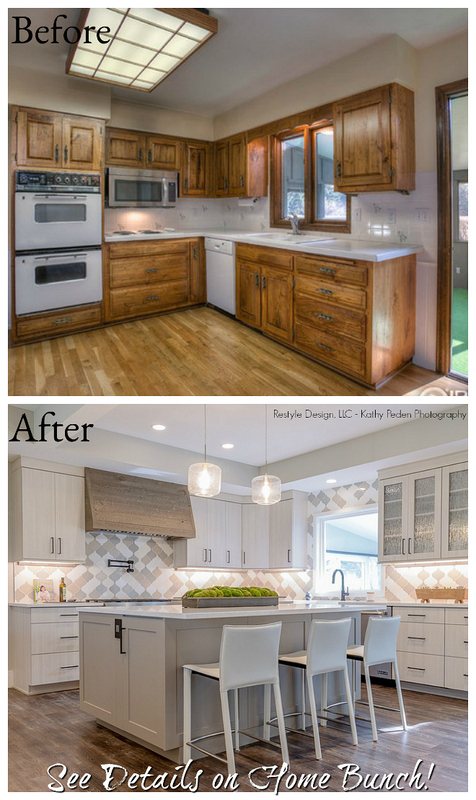 They purchased their home and it was gutted to the studs to make it more open and functional for their family. In my opinion, this home feels trendy without being ridiculous. I am sorry, but please correct if I am the only person thinking that people are overdoing when it comes to trends lately. There’s too much of the same and very little authenticity out there. 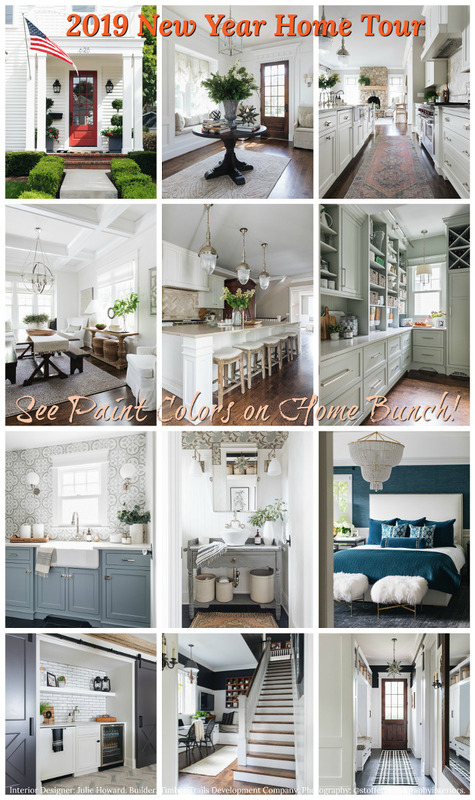 Every house looks the same and everyone seems to be using the same “formula”. 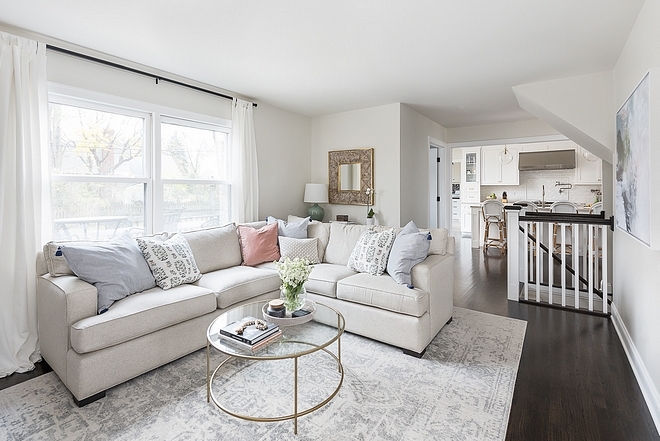 I have been working hard to find spaces that have a “soul” and I hope you enjoy seeing how beautifully renovated and decorated this home was. Nothing feels overdone and you can picture people actually living in these rooms. After all, that’s why we spend time and money with our home; to comfortably live in it. 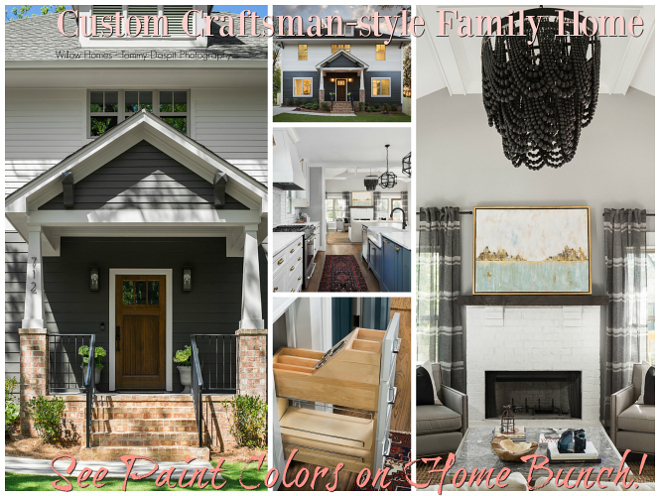 Have fun seeing this lovely family home and feel free to pin your favorite interior pictures and share this house tour! 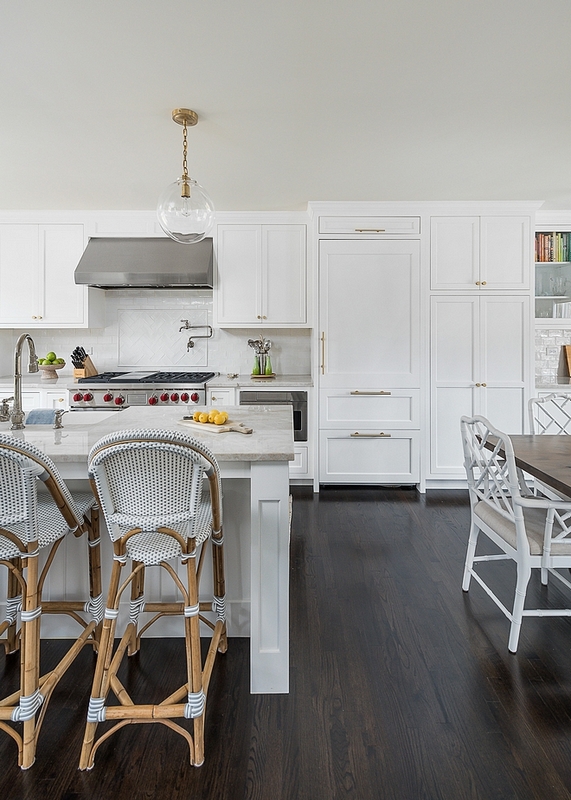 White kitchens will always be a classic choice, add neutral walls and dark-stained hardwood flooring to the mix and you certainly will end-up with a space that will stand the test of time. 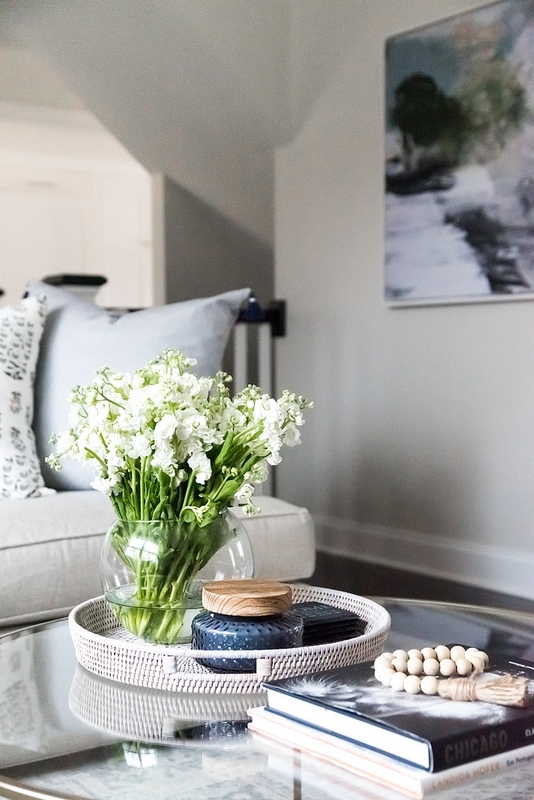 I feel that you can and should have fun with accessories, such as decor, lighting and even with certain pieces of furniture, but try to keep the main elements classic, especially if this is not your forever home. Classic and neutral sells. 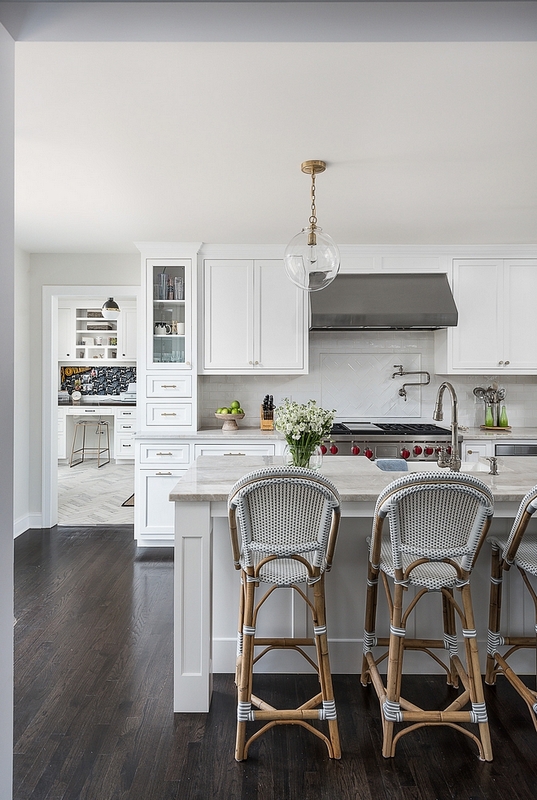 This kitchen features a fantastic layout and plenty of natural light, which is so important. 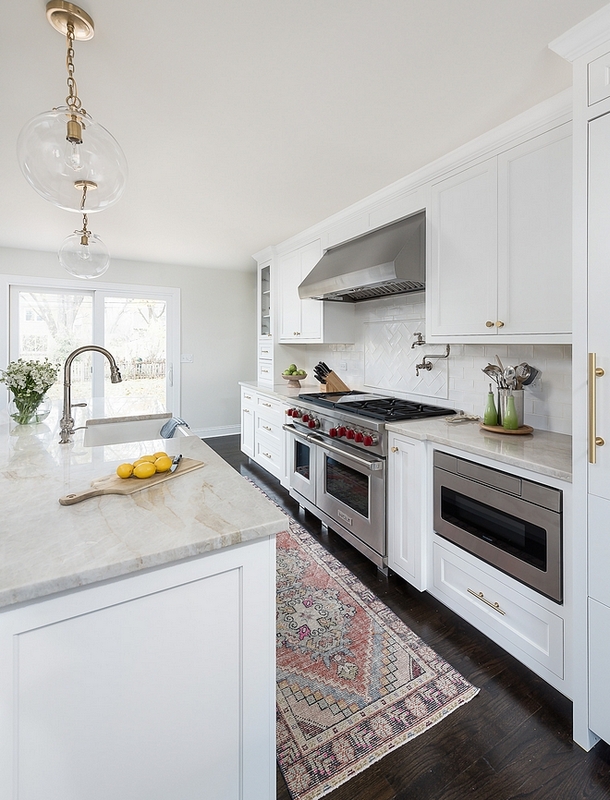 Counters are Taj Mahal Quartzite. Taj Mahal Quartzite is a natural stone and it features a soft white background and subtle gold veins. Beautiful Runners: here, here, here, here, here, here, here, here & here. Kitchen: Kohler in polished nickel. Sink: here & here – similar. 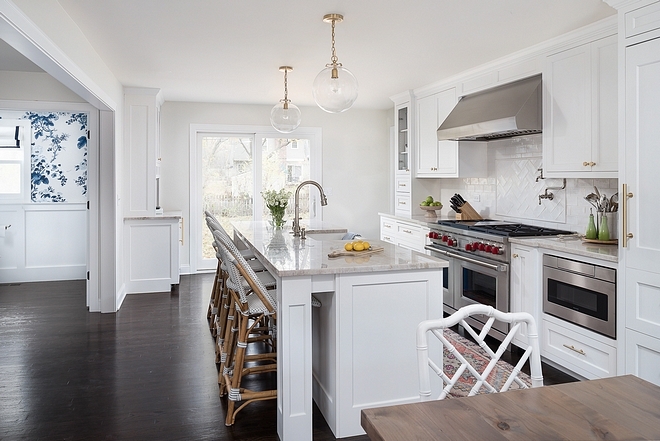 Kitchen Cabinetry and Trim paint Color: Benjamin Moore “Super White”. Cabinet Hardware: Lewis – Similar Pulls & Knobs in brushed brass. 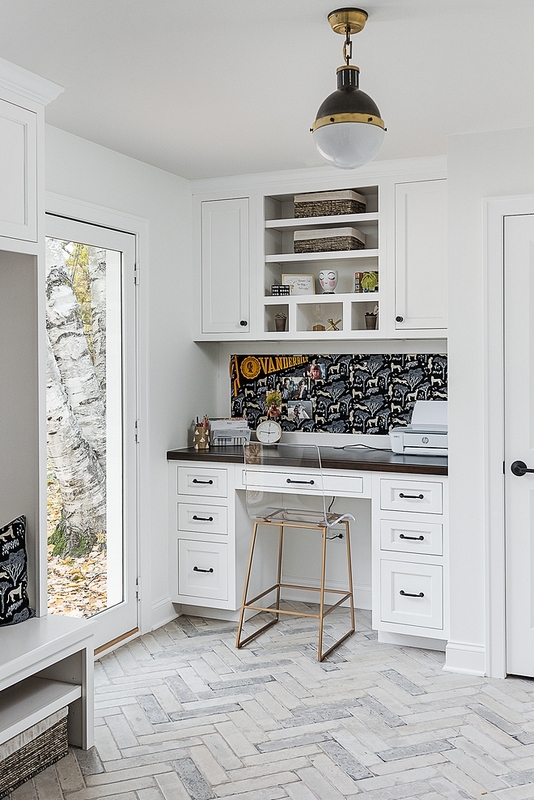 The kitchen backsplash in 3×6 white subway tile. Woven Pedestal fruit Tray: Here. Flooring is solid Oak hardwood in dark custom stain – similar here, here & here (low gloss). 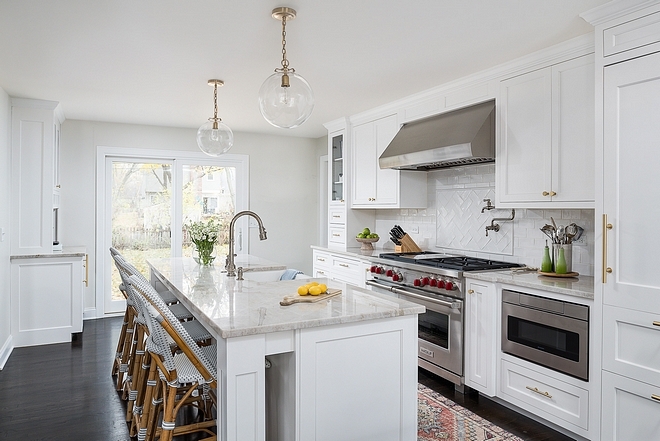 Lighting is Visual Comfort Katie Pendants. 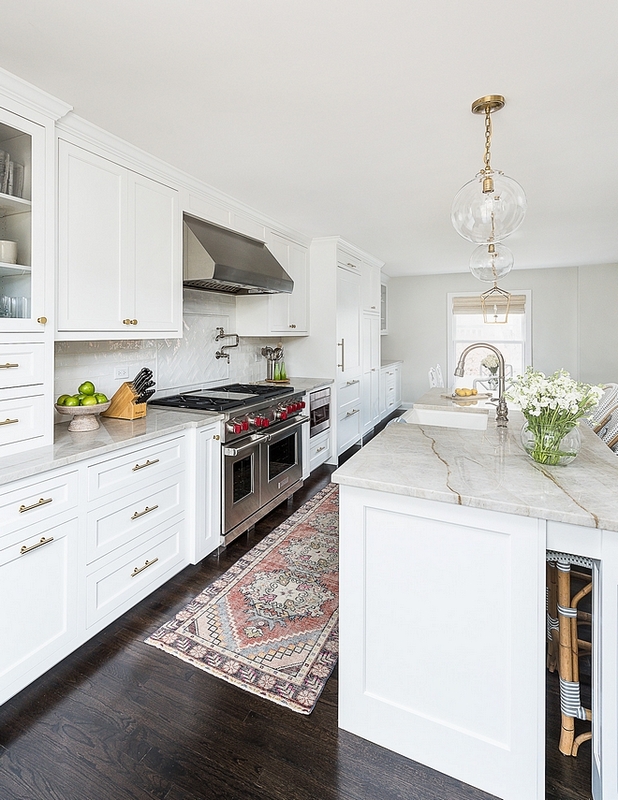 Cabinetry was custom-designed by the interior designer. 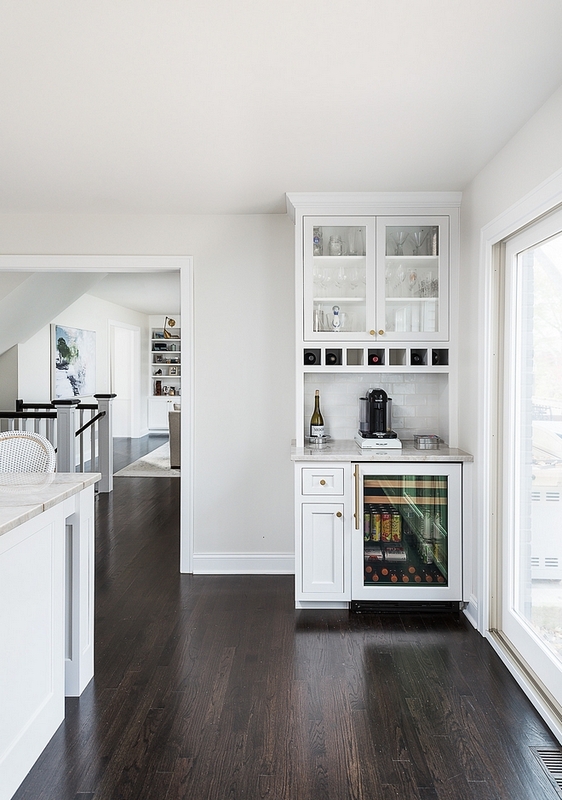 This kitchen also features a practical bar with built-in beverage fridge and upper cabinets. Great design! 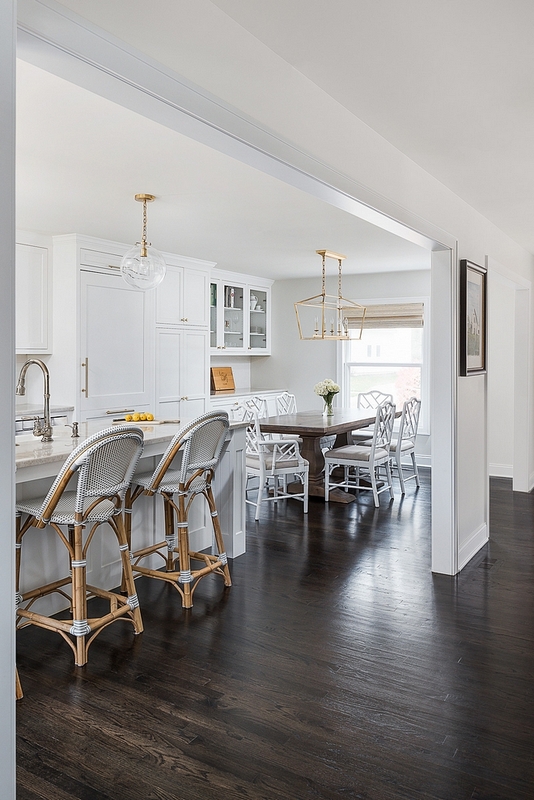 The kitchen walls are Benjamin Moore “Classic Gray”. Window Treatment: Woven Wood Shade similar here. 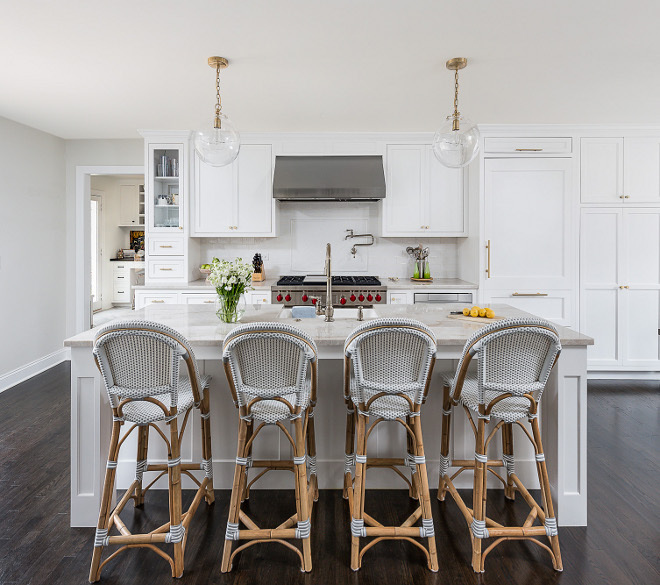 The kitchen cabinets continue to the dining area, allowing for more storage and counter space, which can also be used a butler’s pantry when entertaining. Visual Comfort “Darlana Linear Lantern” – similar here (more affordable option). 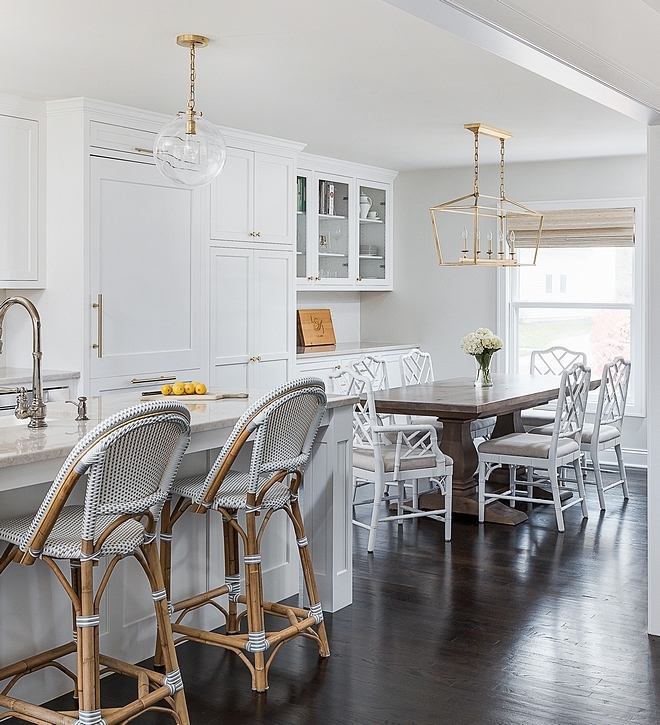 Dining Chairs: Ballard Designs, painted to match cabinets – Similar Host Chairs: Here. Similar Side Chairs: Here & Here. 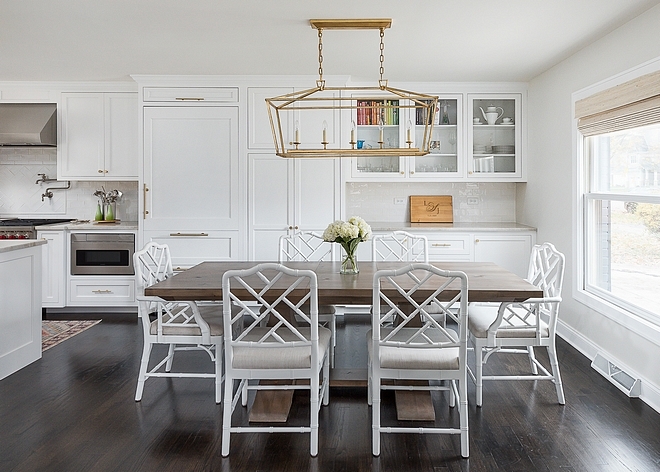 Dining Table: Custom from Here – Similar: Here. 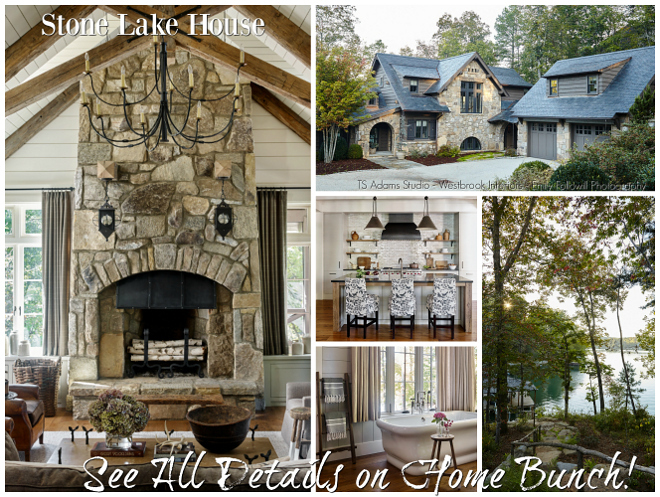 This is why I love this home… because it feels like a real home! 🙂 The decor is approachable and comfortable, and that’s how I also like to live. Paint color is Benjamin Moore OC-23 Classic Gray. Similar Pillows: 3x 24×24 Tassel Pillows (similar here), 2x Block Print Pillows, 1x Blush Pink Pillow, 1x Lumbar Pillow. Rug: Mistana – Others Similar: Here & Here. 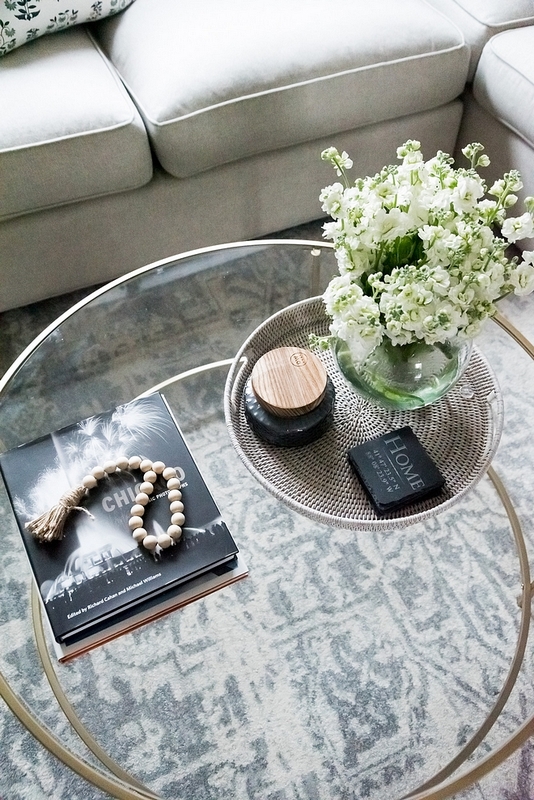 A woven tray brings some texture to this glass coffee table. I like how the designer decorated the coffee table without over cluttering it. Simple is always best. Upstairs you will find a newly-renovated laundry room with sliding barn door and dark grey cabinets. Trim, walls and barn door are painted in Benjamin Moore “Super White”. 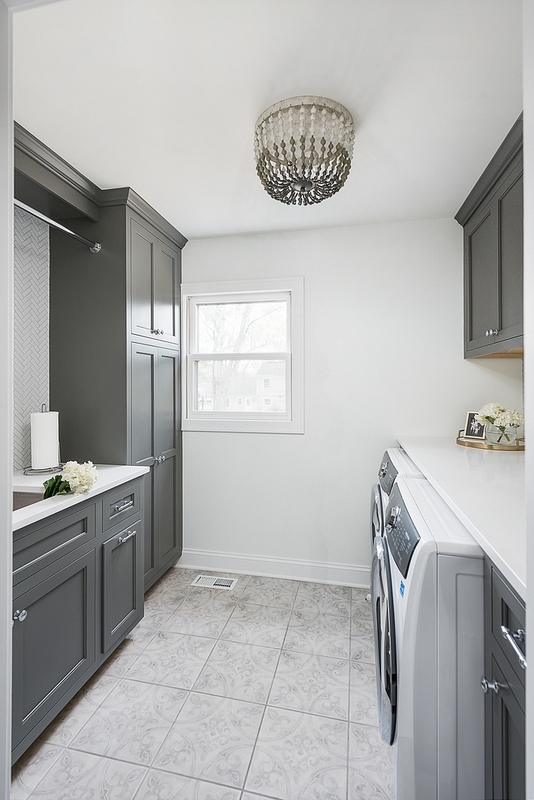 Laundry room cabinetry is Benjamin Moore “Kendall Charcoal”. 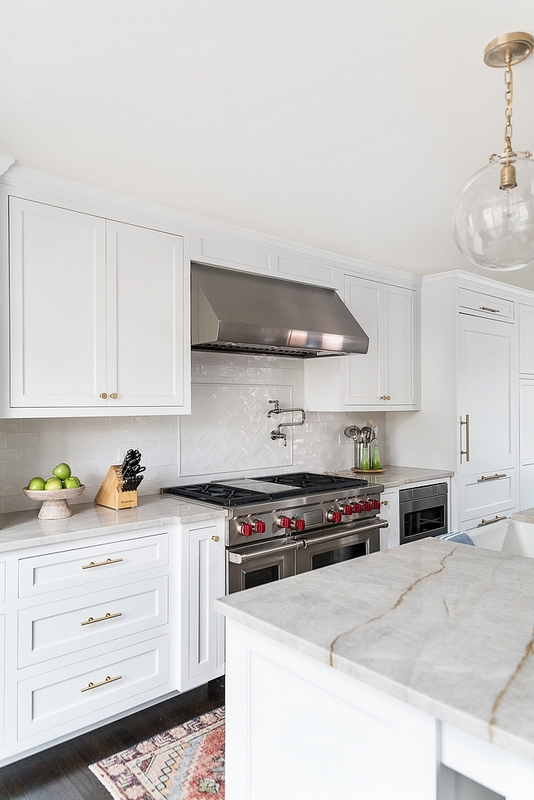 Backsplash is white herringbone backsplash. Floor Tile: Patterned ceramic tile – similar here. This kids bathroom is really a show apart. Can it get any more perfect than this? I don’t think so! 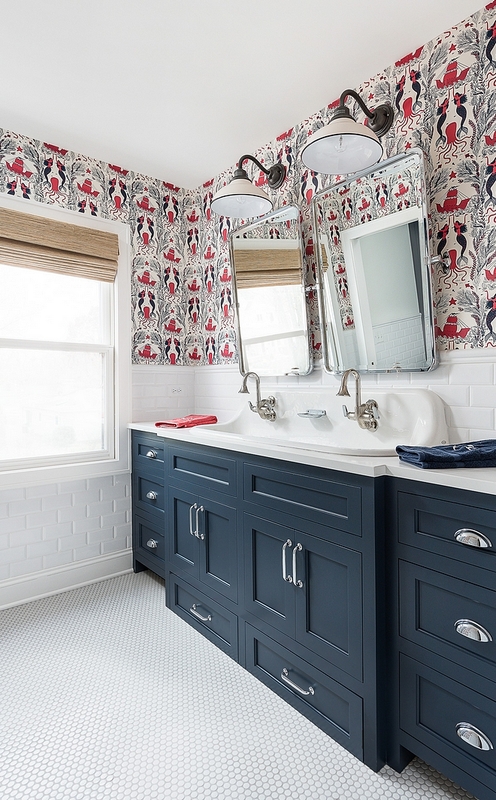 Notice the stunning sink and the classic yet fun color scheme. 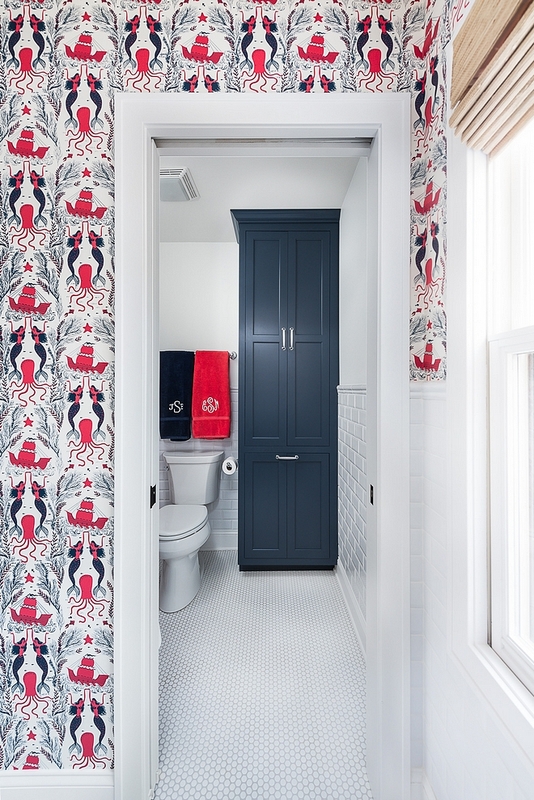 Wallpaper is Hygge and West “Mermaids” in Red Coral. Great Wallpaper Sources: Here & Here. 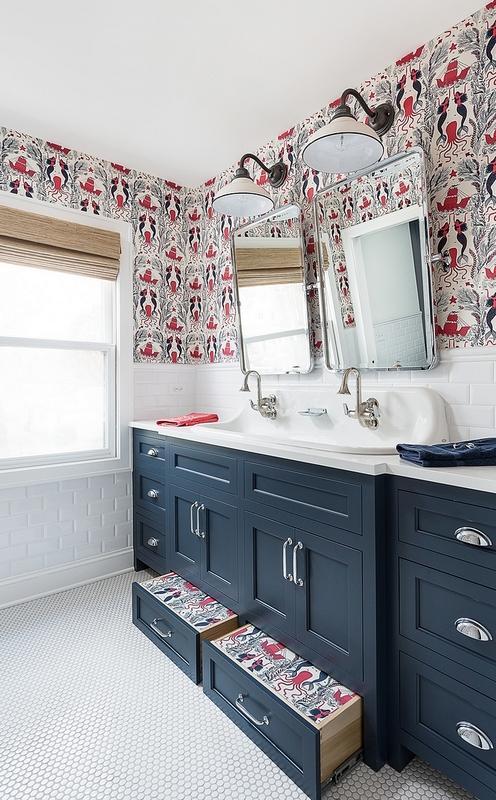 Bathroom cabinetry paint color is Benjamin Moore “Hale Navy”. This bathroom comes even with pull-out step stools under cabinet for kids to reach sink. Cute Step Stools: here & here. Hardware: RH – similar Cup Pulls & Pulls. 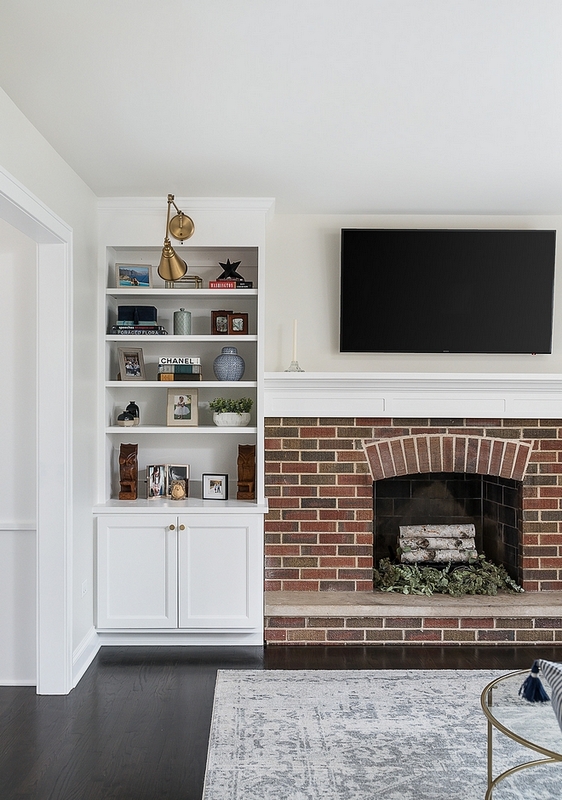 Walls feature 3×6 white subway tile wainscotting. 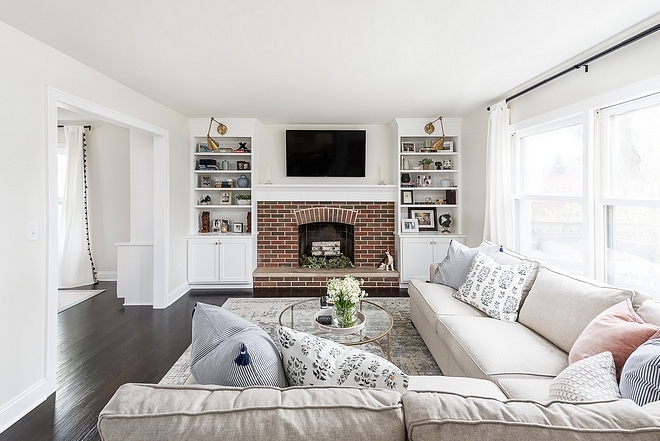 Flooring: Matte white penny tile. 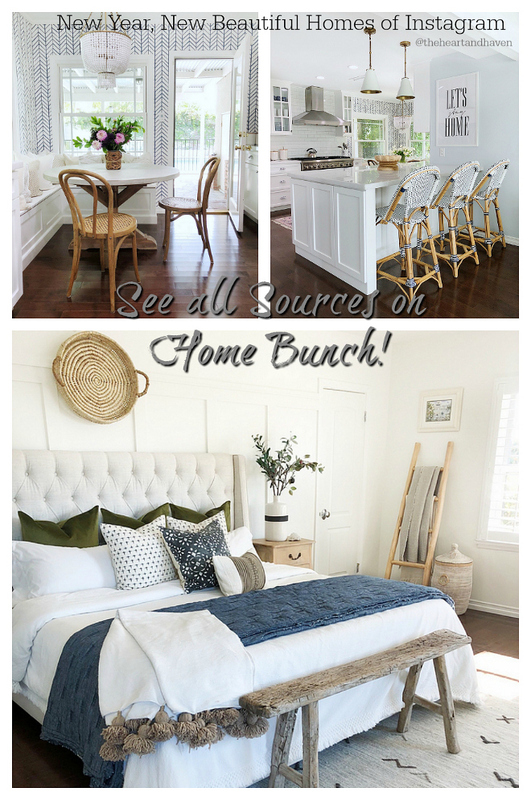 This home keeps getting better! 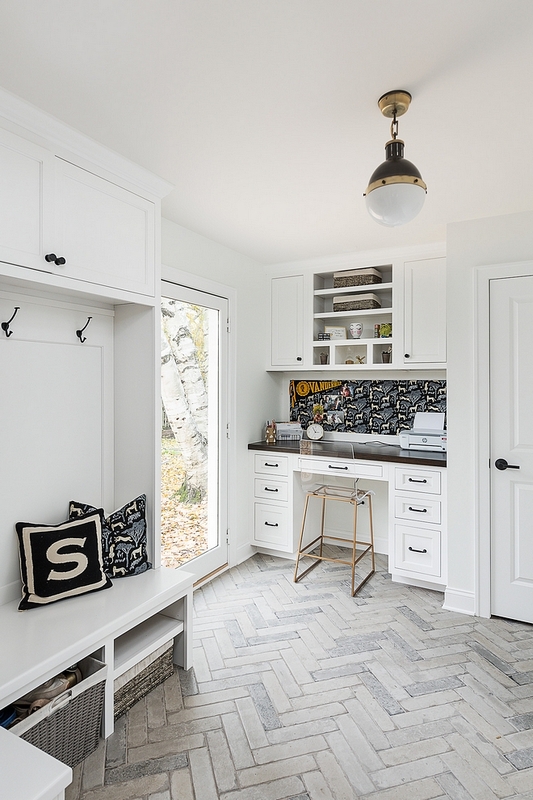 The mudroom is filled with creative ideas, from its herringbone tile to its cabinetry. 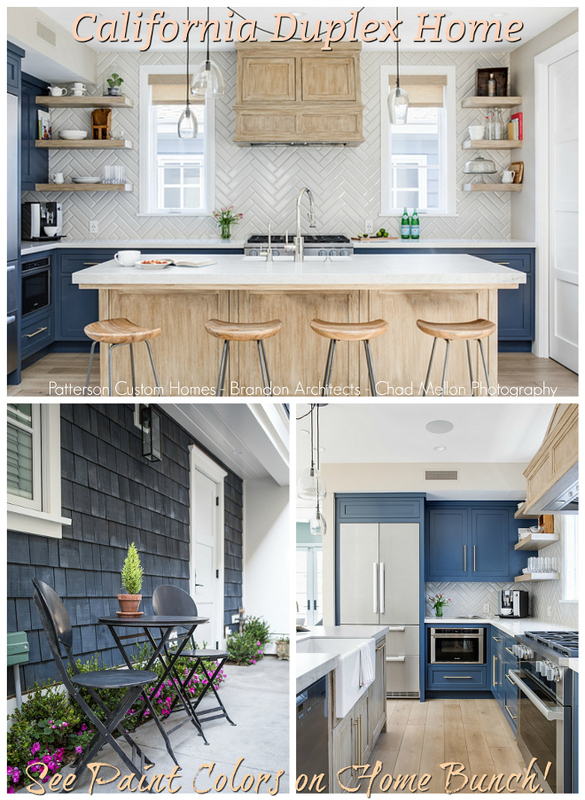 Flooring: Ceramic tile in herringbone pattern – similar here. Lighting: Visual Comfort Hicks Pendant. 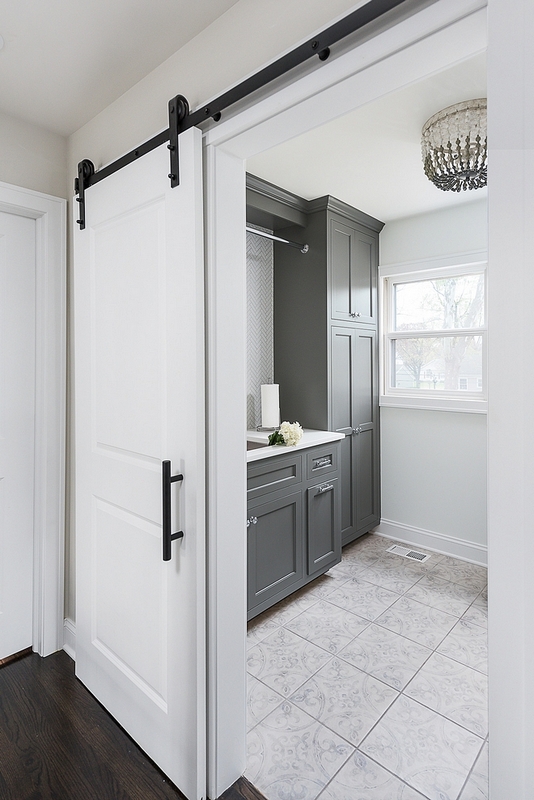 Mudroom cabinetry, trim and walls are painted in Benjamin Moore PM-1 Super White. You can’t go wrong with a working station and this is a great spot for it. 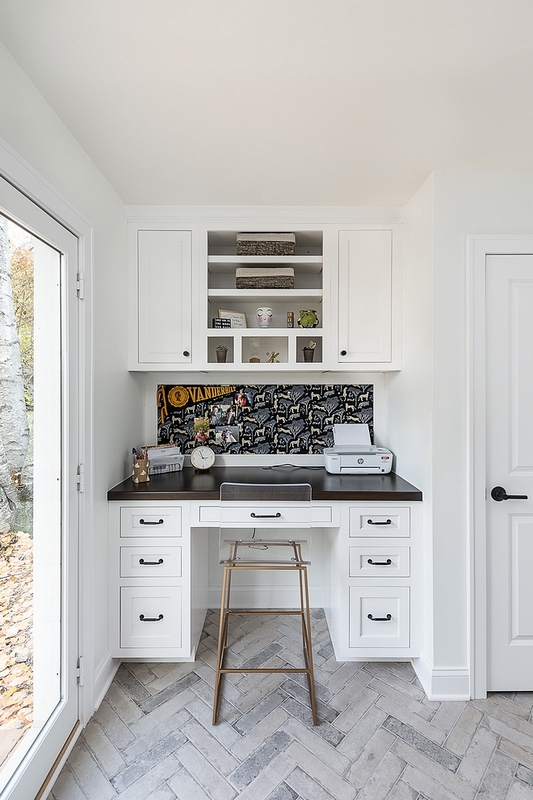 By elevating the desk you create enough height for a file cabinet on each side. Countertop is stained wood. 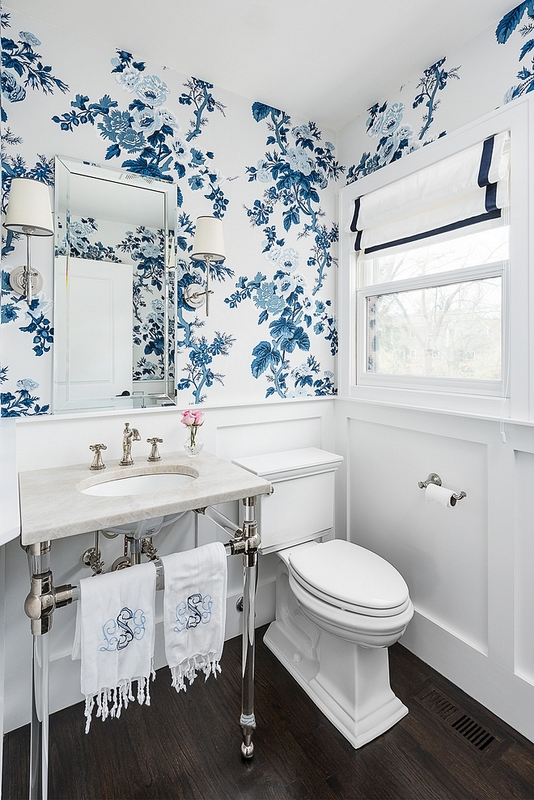 This has to be one of my favorite powder baths I have shared lately. 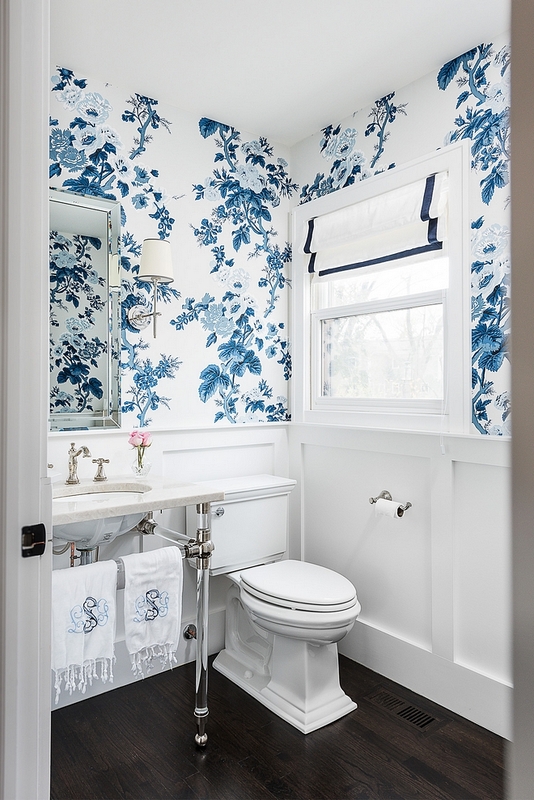 This space features classic wainscoting, blue and white floral wallpaper, acrylic bathroom basin and a dramatic dark hardwood flooring. Wainscotting in Benjamin Moore “Super White”. Roman Shade: Here – similar. 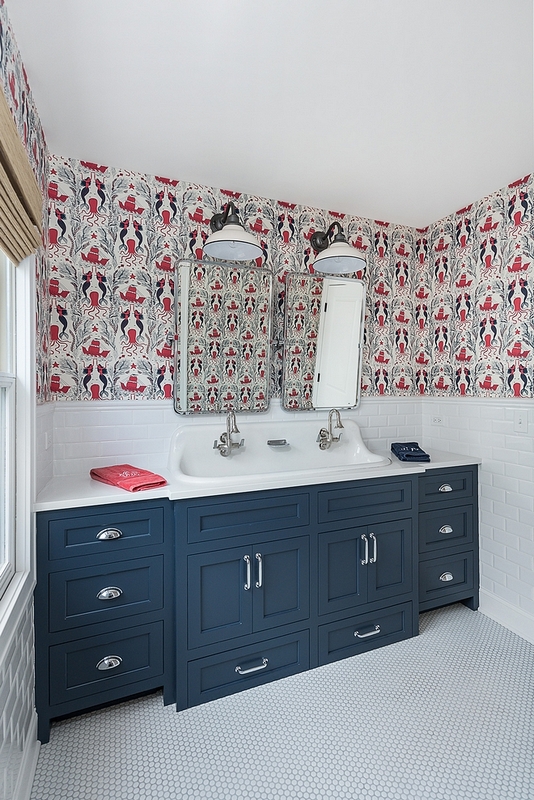 Basin console vanity with acrylic base is from RH with custom Taj Mahal Quartzite countertop – similar here. 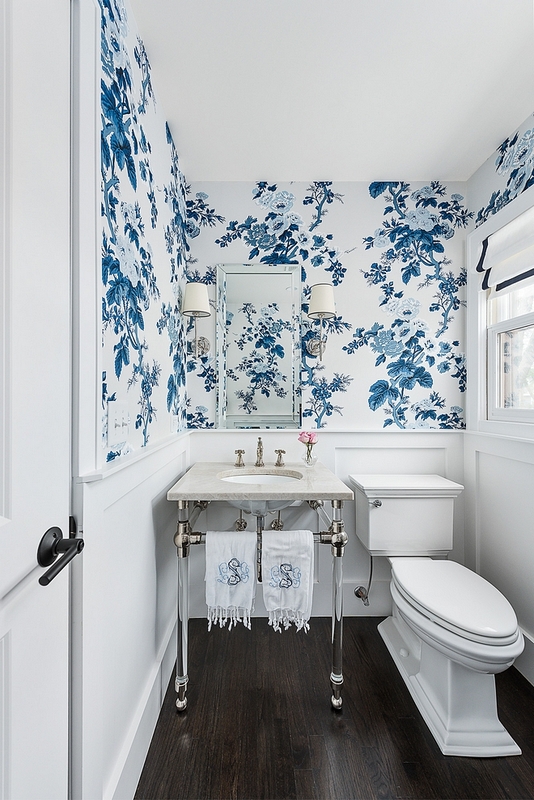 Wallpaper is Schumacher “Pyne Hollyhock” in Indigo. Sconces: Visual Comfort “Bryant” Sconces. 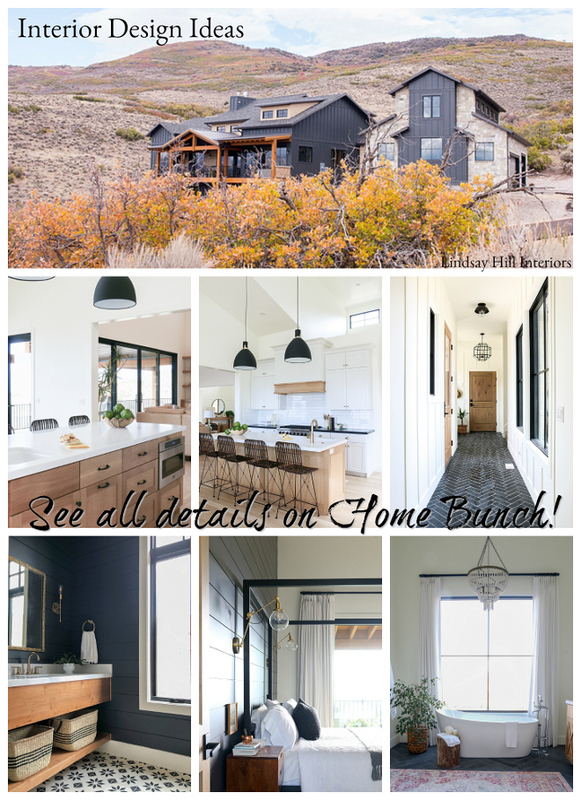 Many thanks to the photographer & interior designer for sharing all of the details above! 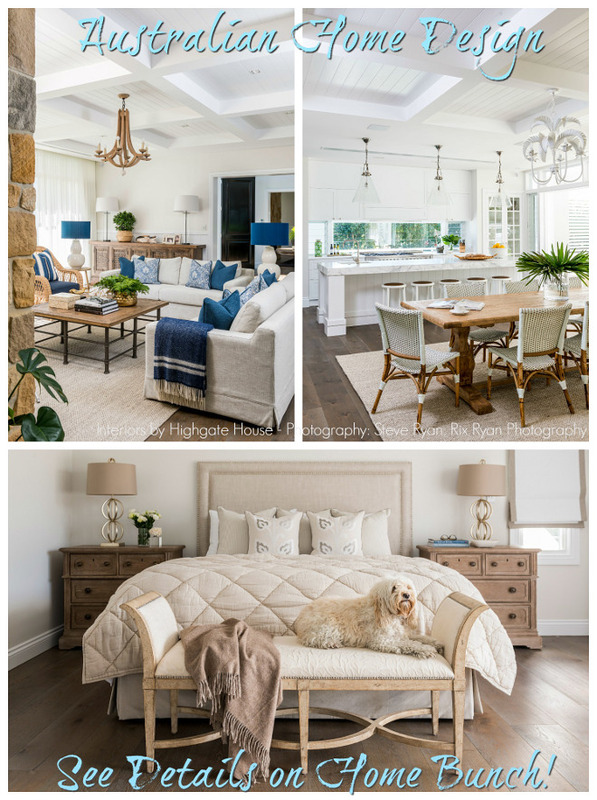 Interior Design: Molly Griggs Interiors.